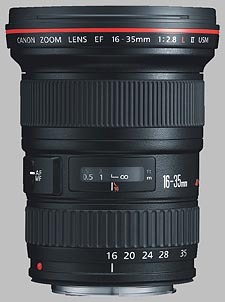 (From Canon lens literature) A new EF 16-35mm f/2.8L II USM Lens succeeds the versatile EF16-35mm f/2.8L USM Lens as a high-performance L-series wide-angle zoom lens, specifically designed for improved peripheral image quality. Compatible with all EOS SLRs past and present, it uses three high-precision aspherical lens elements and two Ultra Low Dispersion (UD) lens elements to minimize lateral chromatic aberration and to produce superb image quality with excellent resolution and contrast. Other features include internal focusing, a ring type USM (Ultra Sonic Monitor), and new AF algorithms for fast and quiet autofocusing. New coatings minimize ghosting and flare. It is an internal focus design, so the front element does not rotate during focusing and zooming, a convenience for users of circular polarizer filters. The lens is also fully gasketed and sealed for dust and moisture resistance, and it features an electronic diaphragm with circular blades for natural-looking background blur effects. The Canon EF 16-35mm f/2.8L II USM is an update to a classic ultrawide lens. If you're reading this review, you probably already know what you're looking for - a versatile wide-angle zoom lens with a constant wide aperture, built tough as nails. The II version of this lens has only a few refinements on the outside: it's 40 grams heavier, takes 88mm filters instead of 77mm, and has slightly different styling. Tucked away inside, there are two more elements, and the literature suggests that there are new algorithms built-in for faster and quieter autofocusing. Given that the release of a new version of a lens tends to force a price drop on the older models, the question will be, is it worth the price to upgrade? We were a bit critical of the original 16-35mm f/2.8L USM, because for the price, we were expecting a sharper lens. Generally, it's difficult to get sharp imaging across the frame with a wide angle lens: the glass has to curve a lot more than in a conventional lens, and lens designers have to juggle how much sharpness they're willing to sacrifice in order to contend with other factors such as chromatic aberration and distortion. The 16-35mm f/2.8L II USM is generally a sharp lens, but shooting at its widest focal length (16mm), it shows some corner softness. Interestingly, the lens seems to be optimized for sharpness wide open at f/2.8, as it performs quite well at this aperture, the softness increasing in the corners at 16mm and f/4 and f/5.6, settling down by about f/11 to some pretty consistent across-the-frame sharpness, until the whole frame softens at f/16 and more at f/22. Zoom out to just 20mm and your corner softness disappears. The sweetest spot for this lens seems to be around 24mm at f/5.6. Canon must have figured out that if someone's going to spend the premium price to get a fast lens, they will probably use it at that fast aperture a significant amount of the time. The previous version of this lens (I'll call it the "non-II" lens to differentiate them, figuring that a "I" would be confusing, as no such marking appears on it) shows generally similar sharpness characteristics, except at 16mm where it's actually a touch sharper than the II lens at every aperture from f/4 to f/16, but not f/2.8. The original version showed wild sharpness fluctuations as you zoomed through its focal length range at f/2.8. The new II version is much better behaved in this respect. On a full-frame body, the 16-35mm II still does well at longer focal lengths, but at the short end of its range, has a lot of trouble with corner sharpness, all the way out to f/8. We don't have full-frame test data for the original 16-35 to compare it to, but given that lens' issues at large apertures on a sub-frame camera, we have to believe that it would be even worse on a full-frame body. The II and non-II versions of this lens actually have somewhat similar chromatic aberration characteristics. On sub-frame bodies, there is some chromatic aberration to speak of with either lens, but the II version of the 16-35mm f/2.8L is much improved at its widest angle settings and at the f/2.8 end of the aperture range. On the non-II lens, CA becomes less of a factor when you zoom out to 24mm and beyond, but with the II version, it drops off by 20mm. At 16mm, the II version has lower CA wide open, but does less well at smaller apertures. - Again, Canon seems to have paid more attention to optimizing this lens for use at its widest aperture. On a full-frame body, the story changes somewhat, with the 16-35mm II showing quite a lot of CA at 16mm and f/2.8, decreasing as you stop it down. Things improve as you zoom longer, but at 35mm, CA creeps back up again, albeit not to the levels seen at 16mm. On a sub-frame body, you do see some vignetting with either version of the 16-35mm f/2.8L lens, but nothing to write home about - at its worst, you are losing a quarter stop or so of light in the corners, zoomed out wide (16mm) and fast (f/2.8). At f/4 with either lens, you won't see any at over 20mm. As noted, we don't have test data for the original 16-35mm on a full-frame body, but the II version does struggle quite a bit more there than it does with sub-frame sensors: Shading was very high at 16mm on our EOS-5D test body, hitting 1.75 stops at 16mm and f/2.8, decreasing as you stop down, but never getting better than 0.5 EV at that focal length, regardless of the aperture. It does better at longer focal lengths, but never gets better than about 1/3 EV anywhere in its focal length or aperture range. Distortion is usually a factor with wide angle lenses, and it's no exception here. Lens manufacturers use aspherical lens elements to compensate for the distortion that can result from the short focal lengths used in wide-angle photography, to varying levels of success. In the case of the 16-35mm f/2.8L, the lens appears to have been designed to give the lowest-distortion images at 28mm on sub-frame bodies, and at about 22 mm on full-frame bodies. At 16mm on a sub-frame body, you're looking at a worst-case scenario of less than 0.5% barrel distortion averaged across the frame and a bit more than 0.5% barrel distortion in the corners. At 35mm, you actually get a little (less than 0.2%) bit of pincushion distortion in the corners. This is a significant improvement over the non-II lens, which showed almost 1% of barrel distortion in the corners at 16mm, and didn't lose it until fully zoomed out at 35mm. In either case, Photoshop makes it quite easy to correct for any distortion present in an image. On full-frame bodies, the 16-35mm II shows much more distortion, varying from a bit under 1% barrel at 16mm to about 0.5% pincushion from 24-35mm. With its USM (ultra-sonic motor) designation, it doesn't get much quieter and faster when focusing the 16-35mm f/2.8L lens. A full-rack focus takes less than half a second, and point-to-point focusing is lightning quick. The 16-35mm f/2.8L II USM has a rated close-focusing distance of 28cm (0.9 feet), but this isn't a lens you'd typically use for macro work. The non-II lens has identical characteristics in this regard. As an L-class lens, Canon doesn't spare much in the way of expense to ensure that these lenses keep going and going. The 16-35mm f/2.8L is weather- and water-resistant, employing several rubber gasket seals. Its construction is primarily metal, weighing in at a chunky 640 grams (22 1/2 oz). One of the changes implemented in the II version of this lens was an increase of filter size from 77mm to 88mm; I suspect this was to eliminate the need for special ultra-thin filters to avoid vignetting when shooting at 16mm. The 88mm filter uses metal rings, and as you would expect for this caliber of lens, the filter doesn't rotate while focusing. It's geared to allow manual focusing at any time (just turn the focus ring) but you can switch the focus selector to manual if you'd rather not autofocus when half-pressing the shutter button. As an EF lens, it's compatible with full-frame film and digital bodies, which means it will go as wide on a full-frame body as the Canon EF-S 10-22mm f/3.5-4.5 USM will on a subframe camera. The boxed package comes with a monstrous 88mm lens hood, which does a good job of restricting lens flare coming in from the sides. Shooting straight into the sun, flare is a non-issue, but you do need to be on the lookout for light striking the huge curved front element from an angle, if you have flare sources off-axis. Keep in mind that using a camera's built-in flash with the hood attached to this lens is pretty much guaranteed to give you a shadow on the bottom third of your photo. Canon introduced the II version of this lens to replace the original version, which usually means that the price for the original will drop over time as dealers liquidate inventory to make room for the new version, and as used copies appear on the used market as owners upgrade. The original 16-35mm is a capable lens, actually a touch sharper at 16mm from f/4 to f/16, but where it counts, the II wins. Chromatic aberration and distortion are improved in the II, so really, whether it's worth it to buy a non-II over a II depends on what kind of deal you can get. Coming in at around half the price, the 17-40mm f/4 offers a similar focal length range at the cost of just one f-stop of aperture. Sharpness is excellent at almost all focal lengths and apertures where you would typically use a wide-angle lens. Vignetting is well-controlled, though chromatic aberration and distortion are better controlled on the 16-35mm f/2.8 I and II. The 17-40mm is bit (135 grams) lighter than the 16-35mm. Comparable lenses, to be sure, and I would think it comes down to whether you need that millimeter of extra wide-angle, and better handling of chromatic aberration and distortion, or the extra stop of aperture. 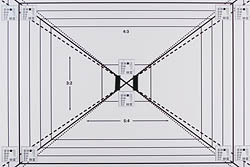 To give you an idea, at 16mm you have a 108-degree field of horizontal view; at 17mm, you have a 104-degree field of view, not a huge difference. The aperture difference is what most shooters will be swayed by: Decide for yourself how much it matters to you. Unfortunately, we don't have test results yet for this Sigma offering, nor do we have any user reviews on it as of this writing. If you were on a budget and looking for this range of focal lengths though, this lens would probably be a strong contender. With hypersonic focusing, its focusing should be quick and silent; with the use of more plastic components, it should be significantly lighter. It's not a subframe lens, so you could use it on your full-frame or film camera bodies as well. Tamron's offering represents a serious cost savings in comparison with the Canon 16-35mm, but you are definitely not getting a similar quality lens. In addition to the 1mm difference in minimum focal length, corner softness is considerably greater at f/2.8, but goes away by f/5.6. In short, if you need a wide-angle and don't need to shoot wide open, you'll see great results from this lens, but don't expect the sort of ultra-rugged construction found in the 16-35mm f/2.8L II. Based on our tests, the Canon 16-35mm f/2.8L II USM is a solid lens offering in the ultra-wide category. It has a few issues with softness at certain apertures and focal lengths, a little chromatic aberration wide open, as well as some distortion and vignetting to speak of. But it's also a dramatic improvement in all of these areas relative to its predecessor, which shows that the Canon design team has come up with ways to tackle all of these issues. It's not perfect, but then again, neither is any other lens in its category, and for what it does, it doesn't get any better than this. Beginning in July 2007, we now provide sample photos of two laboratory test targets to help in our readers' evaluation of the lenses we test. 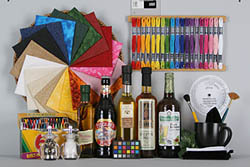 The VFA target should give you a good idea of sharpness in the center and corners, as well as some idea of the extent of barrel or pincushion distortion and chromatic aberration, while the Still Life subject may help in judging contrast and color. We shoot both images using the default JPEG settings and manual white balance of our test bodies, so the images should be quite consistent from lens to lens. I bought this lens rather cheaply because of the damaged front part of the barrel with warped filter thread. Looked horrible but the filter could still be mounted. I got that fixed later while repairing an unrelated damage case. This lens is very sharp except in the outer corners at wider apertures (usually doesn't matter much). The AF is fast, silent and very accurate - addictive! :) Great weathersealed build that helped me a lot in the deserts of China and the dusty highland of Tenerife. I was lucky to have purchased one of the best copies for this lens . . . ultra sharp from 16mm through 35mm. This is a must have lens if you do a lot of group shots especially for weddings. Like all of the other "L" series, it is overpriced but you get what you pay for. fast, good resolution, good constrution, nice contrast and colour. This lens is Canon's best and newest wide angle zoom and out performs my 17-40mm f4 by a small margin. It is well built and has nice contrast. As with most lenses it performs better when stopped down and vignettes slightly at f2.8. On my full frame 1DS Mrk3 the lens is very sharp in the center and slightly soft in the outer zone, even when stopped down. This is noticeable on an A2 print. Unfortunately the lens isn't in the same class as the Nikon 14-24mm f2.8. I have recently bought this lens in the UK to go with a Canon 5D, as the cheapest way into full frame, even though I am at heart a Nikon user. Cant run to a D700 sadly. I have used a 17-40L before on crop Canon bodies and first impressions are that it is at least as good, the extra 1mm of angle does make quite a difference. I note there does seem to be some sample variation from other posts, the same with all marques I am afraid, QC seems to have gone down the tubes in the last few years, wonder why? The lens is sharp at all apertures, some vignetting at the wider end, and colour and contrast are all you could possibly ask for. Canon always seem quite a little cheaper than Nikon for their pro spec lenses, even so I would not have paid the new price for this lens, my copy is mint used, as is all mt gear. In short, if you want a wideangle for full frame Canon there is effectively a choice of two, this and the 17-40 L. Cheaper lenses really suffer on full frame, dont be tempted to go there. Great sharpness across focal range. Very sharp at f/2.8. Fast, silent focusing. Does not require thin filters. Awesome build. One of the finest zooms I have used. It ranks right up there with the 24-70L. It compares favorably with primes in its focal range. The larger filters are a pain but allow regular thickness filters without vignetting (even on FF). The edge sharpness is excellent but I dont have a Mk1 to compare to. If you need an ultra wide angle (especially for a FF) this lens is well worth considering.